Bishops on religious freedom: "To recognize conscientious objection"
Santa Cruz de la Sierra (Agenzia Fides) - "Issues related to faith but also to the life of our peoples was highlighted, and this says that our Congress was not a spiritual event, but attentive towards reality, and aware of the challenges we face and we want to address from a Catholics perspective, committed in today's world". This is how Mgr. Eugenio Scarpellini, Bishop of El Alto, National Director of the Pontifical Mission Societies (PMS) of Bolivia and General Coordinator of the Fifth American Missionary Congress, CAM 5, described the "considerably positive" analysis - of the Congress. 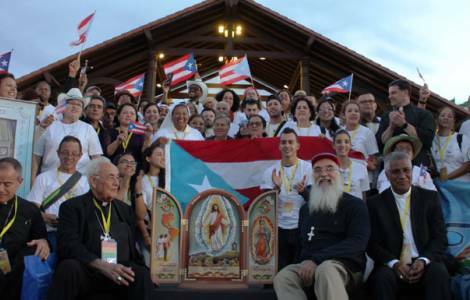 "We came from all the Countries of the Americas, 2 Cardinals, 95 Bishops, 450 priests, 130 seminarians, 120 religious men and women and many, many committed lay people" who, with volunteers and organizers, exceeded 3,100 people, numbers that the Bishop read as indicators of "a missionary Church, that goes forth". Mgr. Scarpellini therefore underlined the importance of the "attitude and the festive environment" constantly lived in Santa Cruz, together with the willingness to deepen the mission, the good news of Jesus who wants to reach everyone". This is what was noted in every moment of the works, "with great interest and participation of the congress members". Also missionologist Professor Roberto Tomichá, of the Pontifical Bolivian University of Saint Paul (PUBSP), speaks to Agenzia Fides of an event "inspired by the teachings of Pope Francis", since the preparation and the instrumentum laboris. A proposal that was also reflected in group work and was expressed in the final document. The Bolivian professor sees a pan-American "harmony" "in terms of theme, methodology and sharing", despite the variety and the difference of the cultures represented. Tomichá, a specialist in indigenous theology, coordinated a group work on the original cultures and peoples during the Congress, and underlines, the "experiences and deep reflections on the reality in which these participants are immersed". Among the major challenges of the mission Ad gentes in America, the one reported in the preparatory document of the Special Synod on Pan-Amazon, linked to the care of the "common house" is emphasized, that "expresses itself in the care of nature in front of the mining activity, mining industry and agrarian and socio-environmental conflicts". Also the dialogue with "others, at every level" is an unfinished task, together with "the urgency of a greater and real protagonism of the laity, especially of women and youth" and to the "recovery of the memory and the wisdom of ancestral millenary life" of the indigenous peoples and the African Americans, a debt to be paid for a Church "that wants to be credible" in society. A greater awareness of the complementarity science-faith and of the need for science and technology to be enlightened by faith was perceived by the Rector of the PUBSP, Marco Antonio Fernández Calderón. The delegates from the 24 countries represented are enthusiastic. Sister Ana María Rivera, Salvadorian, speaks of "an American Pentecost". The young Colombian priest Don Edison Maya acquired a new awareness of the fact that "the Church has the same mission as God", and must "discover it" rather than "build it". The diversity of cultures and proposals, the seriousness of the search for solutions for social wounds, in addition to the "approach" to what should be the woman in the Church struck "Sister Pauline Fofana, Cameroonian missionary of the Crusades of the Church of Mother Nazaria Ignacia (presented as a model and patron of CAM, who will be canonized on October 14).